After managing to claw back from earlier losses in the year, copper prices are once again on the slide as renewed inventory concerns and slowing growth from China put the industrial metal back in the spotlight. Despite reduced output from major global producers and lower prices, the recent jump in Chinese demand does not appear to be enough to offset concerns that the outlook for the metal remains dour considering waning global growth and remaining overcapacity, especially in the refining process. Without a new round of production cuts from the mining and refining industries, coppers recent momentum lower could be extended, with a possible tumble to new multi-year lows in the sights. One of the main problems underpinning the most recent rout in industrial metals is the spare capacity that was brought online during the post-crisis years when interest rates were exceptionally low. This made borrowing to finance mine expansion and magnified refining operations especially cheap, leading to overproduction and excesses that have seen the metal’s prices drop precipitously. Over the last year alone, copper prices have plunged by -23.73%, remaining firmly in a bear market despite a near 20.00% bounce from January Lows. While part of the weakness has been attributed to Chinese stockpiles being reduced by half amid more limited demand, one of the primary drivers of recent losses is surging inventories. According to data from the London Metal Exchange (LME) released last week, stockpiles in facilities monitored by the exchange rose by 30.00% in just two days, reaching the highest levels since February. While the weaker US dollar has helped commodities prices recover modestly, the latest inventory data raises concerns that Chinese demand remains sluggish, a variable that could very well impact copper consumption going forward. Even though China reportedly saw copper imports climb 19.40% in May year over year, much of these gains accompanied new debt creation as local industries struggle with heavy debt burdens. Going forward, imports are expected to ease, potentially throwing the current price equilibrium back into disarray, with supply outpacing demand. Already other Asian warehousing facilities are filling with Chinese purchases as traders move to shift the surplus. Additionally, while the industrial production remains intact in the nation, climbing 6.00%, fixed asset investment is still decelerating, tumbling to the slowest pace in 16-years of 9.60% year over year expansion. If economic activity continues to stall, copper prices might rapidly fall in the wake of slowing growth. 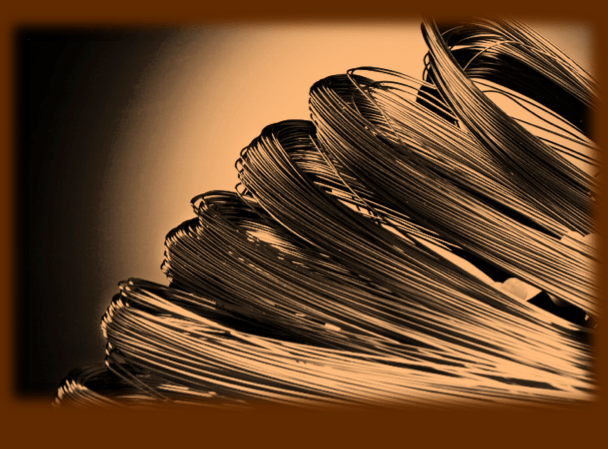 Looking at the price action in copper over the last few weeks it is becoming considerably more evident that the bounce that began earlier in the year after the industrial metal touched multi-year lows has run out of steam. 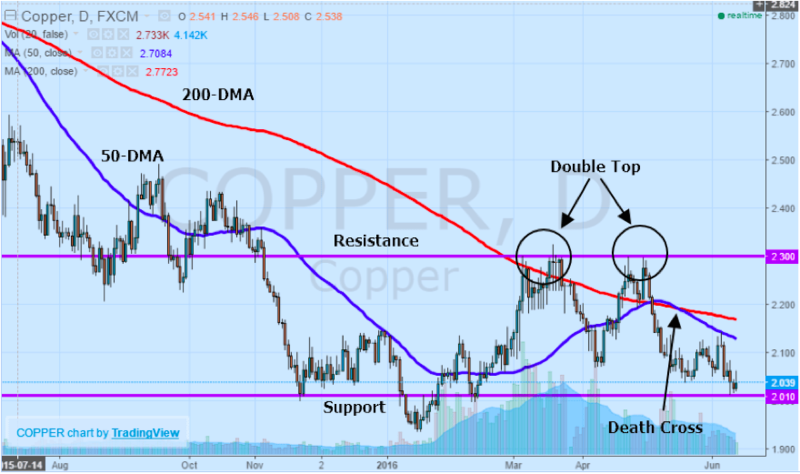 The double top that formed at $2.300, a resistance level reached but not crossed back in March, April, and May has been standing in the way of further gains for copper, suggesting that a renewed leg lower is gaining momentum. Support that remains in the way currently sits at $2.010, with any breach of this level paving the way for losses towards multi-year lows at $1.936. Adding to the ongoing bearish bias brought upon by the prevailing longer-term downtrend are the moving averages. With the 50-day moving average crossing the 200-day moving average to the downside, the emergence of the “death cross” in May is exceptionally bearish for the outlook. 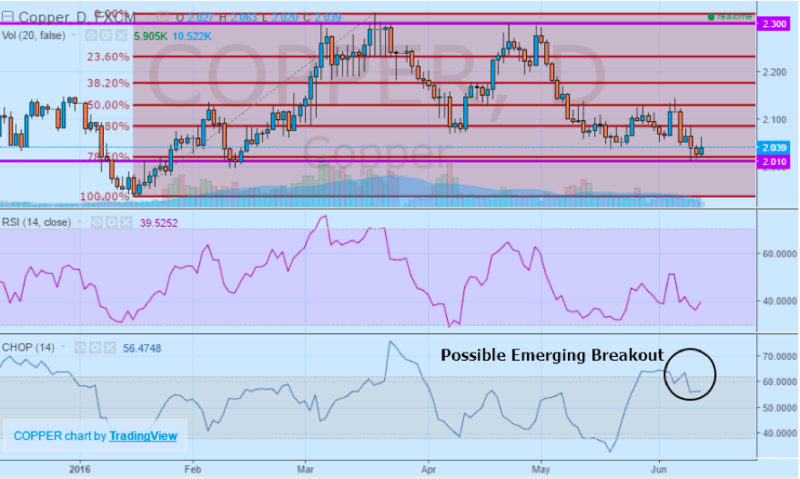 Even though copper is looking slightly oversold according to the Relative Strength Index, the Choppiness Index falling below the 62.80% level could indicate an early stage breakout to the downside. Looking at the actual Fibonacci Retracement levels from the January lows to the March highs shows that while a technical correction to the medium-term uptrend may be underway, the bounce off of 78.60% level is more indicative of a reversal than an uptrend momentum pullback. Typically, a correction would be reasonable between the 38.20% to 62.80% levels, in keeping with the standard 30.00-60.00% retracement that is a hallmark of technical analysis. However, this current move even deeper to the downside is highly indicative of a trend reversal and not a trend correction. Therefore, any break of key support at $2.010 could viewed as exceptionally bearish for copper. One of the critical developments in the upcoming trading sessions is the forthcoming decision from the US Federal Reserve. Although no imminent rate hike is expected to come from this week’s FOMC Decision, any hint about the timeline for further policy normalization could see the US dollar rebound from recent weakness, pressuring industrial metals prices lower. Outside of monetary policy is industrial and manufacturing data due from across the globe including the Euro Area, Japan, and the US which could have a minor impact on prices. However, should Chinese economic activity continue to taper, the stage is most certainly set for another round of losses in copper as demand for the industrial metal falters.